First, it’s going to help you retain customers. Getting one group to come out to your ranch for a week is a positive step, but making their trip so special that they decide to do it every year? That’s what takes your ranch to the next level. Guest ranches have the unique opportunity to offer the trip of a lifetime, and if you make customer satisfaction a priority, you could easily find yourself with a list of clients for life. Some of the most iconic ranches have entire families that have been coming back every year for the past 20 years! The DRA has noticed a similar trend where people are trying out different ranches each year. Enough customer satisfaction earns your ranch a reputation, and with strong recommendations, you could find yourself on many people’s bucket lists. We’ve all had that frustrating experience: guests arrive at the ranch, tired and hungry; they did not return their check-in and liability waivers so their first hour at the ranch is spent filling in paperwork. You scramble and try to make them happy all week, but alas, they leave disappointed. Setting expectations for your guests before they arrive at your ranch has a huge impact on customer satisfaction. You want to make sure that your guests are going to have a great time, but also fully understand what they’re getting into and what they’ll get out of it. One way you can do this is through the communication you have when they book their stay. It is standard in the guest ranch industry to show your guests that you truly care about their needs by asking questions that will make their stay feel more personal and like all their needs are taken care of. Some of these questions might be asking if they have any food restrictions or allergies. Will they need transportation to and from the airport? Do they have any people with disabilities in their group that the staff should be ready to assist with? However, you can go above and beyond by making sure your guests can easily provide this information whenever they want, and that you can retrieve and organize all that data easily. Paper forms just won’t cut it. You need a computer system that will let you create that seamless check-in experience, make it available to your guests 24/7 and crunch all the data for you. RanchBookings can help you there. Another way you can use customer satisfaction to build on your ranch’s success is by taking advantage of what you already know is working and using it to build even more positive experiences. For example, the things that your staff does, or your ranch offers as a whole, that really boost customer satisfaction are the things that will help you see long-term success. Instead of spending time on new strategies and tactics to help customers be happy, look at the 20 percent of what you’re doing that’s leading to 80 percent of your success. Take that 20 percent of your efforts and expand upon it to give your customer’s a trip they’ll never forget. So, how can you determine where your customer satisfaction is coming from and develop new ideas? Get feedback! 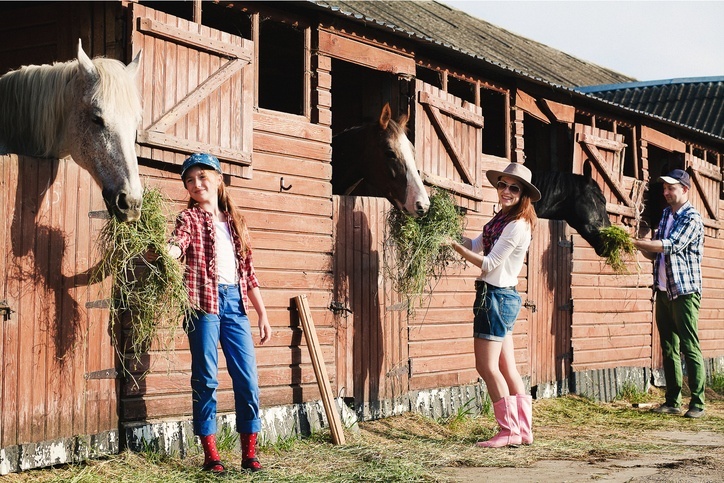 Knowing what customers think is the best way to learn what they like about your guest ranch. Surveys are one way that you can gather information about guests’ stays and see what made an impact on them. You can use software services to build automated surveys with questions you create that send to your guests right after their trip. You’ve probably seen these surveys after staying at a hotel, or even after using a product or service, and your guest ranch can take advantage of them as well. This is the easiest way to find out people’s opinion without having to manually get information from them. And these surveys don’t have to just be used for feedback, either. Surveys can also help you pull valuable testimonials that you can use on your website and share in marketing materials. At the end of your survey, you can even encourage your guests to leave a review on a third-party site to broaden your reach and increase the amount of traffic that your ranch receives. Of course, at the end of the day, these strategies only add to the amount of work you have to do with managing bookings and upcoming reservations. It’s tedious work and a lot to handle, and that’s where RanchBookings can help. Our online booking and management solution allows ranchers to get their lives back without losing the personal touch with their guests. We help you streamline your booking process and allow you to create surveys to build on customer satisfaction, so you can get your life back while still delighting your customers. Learn more about how our software works here.